Improve your relationships, manage your stress, gain self-esteem, be successful at work, and much more. Through this book's simple rule of three, you will learn what thousands of Dr. Osit's patients have learned over his 40-year-career: the life you want is achievable. This book outlines a three-point action plan that consistently enables patients to resolve issues and experience personal growth. One suggestion was not enough. Two left room for error. Four was overwhelming. Three seemed to stand together, like a tripod. Each chapter covers a life function and contains three practical suggestions that you can use to help achieve happiness, freedom, and self-fulfillment. The challenges of raising children in today's culture of easy technological access to the world and an age of excess are addressed. 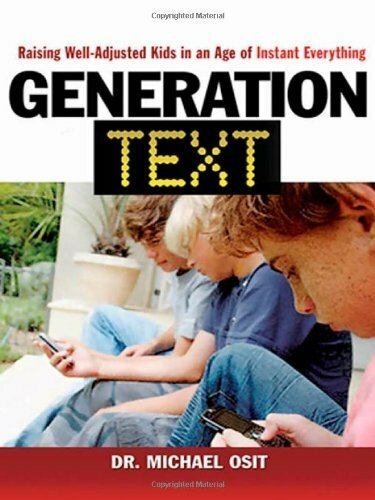 As a highly prescriptive parent handbook, Generation Text helps you and your kids navigate through the world filled with Internet hazards, media messages, and peer pressure. Feindler, E. L. & Liebman, M. G. (2015) Behavioral assessment, goal setting, and intervention planning. In Cognitive and Behavioral Interventions in the Schools: Integrating Theory and Research into Practice. Springer Publishing.